AS LICENSED PLUMBERS WE HAVE ACCESS TO ALL SOFTENERS, WHY DO WE CHOOSE NUVO ? Both personally and professionally we have chosen Nuvo H2O as our primary water softening system, but why? We have access to every model water softener on the market, why did we choose Nuvo Water Softeners and Nuvo H20 for our own home in Phoenix and to educate clients on this system as an option? To put it simply, I believe in this system, and here are a few bullet points why. 1.The Nuvo H2O softens water with citrus – not salt. This water softener naturally conditions water without the hassle of salt and without the potential health risks of salt. The process of chelation binds with hard water minerals so they cannot react with other elements to produce scale. 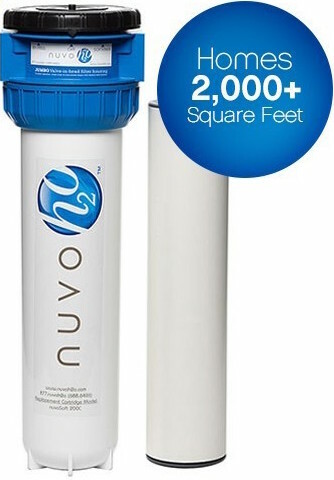 2.Unlike salt-based softeners, Nuvo H2O not only prevents hard water build-up it also REMOVES existing scale! Seriously, how cool is it that this system will actually start to remove scale build-up on your current plumbing fixtures improving the quality of your plumbing? Over time our clients can actually watch mineral build-up on faucets and shower heads reverse. Prevention is amazing but reversing build-up is even better. 4.Size matters. Salt water systems take up a lot of space, not only with the system but with bags of salt stored nearby. The Nuvo H2O system doesn’t take much more space than a garden hose hanging on the wall. 5.Nuvo H2O cartridges are lightweight and easy to change out every six months. Many people struggle with the weight and awkwardness of large bags of salt, that is no longer the case with a simple cartridge that is replaced every six months by removing the canister and simply inserting the cartridge. 6.The aftermath of the filter breaking – When a salt softener screen breaks, the resign from the media tank actually contaminates your plumbing with resign that can be very costly to remove. Your entire plumbing system and water heater have to be flushed and often the parts inside your faucets, showers and toilets have to be replaced, costing thousands of dollars in repairs. If a Nuvo H2O cartridge breaks, you end up with very pretty blue water that indicates that you need to shut off the by-pass valves and have the cartridge replaced. No painful and costly plumbing repairs and no going without water in your home until the plumber can repair your entire system. 7.The Nuvo H2O does not leave a filmy feeling when you shower, this is a common feeling that people experience with salt softening systems, so if you are in the market for a softener for that feeling, this is not the system for you, you should stick with traditional salt. If you are in the market for a softening system with the intention of extending the life of your plumbing, water heater, dishwasher, washing machine, faucets, shower valves and toilets the Nuvo H2O should be at the top of your list of considerations. 8.Nuvo H2O systems can be upgraded to a Nuvo Complete which does more than just soften your water it also offers the ability to filter your water reducing Chlorine, VOC’s, pesticides, hazardous chemicals, odors and improves the taste of your water. If you like these 8 benefits of Nuvo H2O systems, don’t stop here. Give us a call today at 623-486-4657 there are a lot more advantages in choosing a Nuvo Water Softener for you’re home in Phoenix. We look forward to working with you.